My childhood was defined by the summer blockbuster. Each year I can think of one, and only one, major movie that held me — and the entire country it seemed — in its thrall. E.T. (1982), Return of the Jedi (1983), Jurassic Park (1993), Independence Day (1996), the list goes on. Each year there seemed to be one film that unified audiences, and I could discuss this film with everyone I met. I never thought about why this was the case, it simply was a fact. What I didn’t realize for more than thirty years was that the summer blockbuster phenomenon had not always been, but rather started just before my first birthday with the release of Steven Spielberg’s Jaws. The director’s breakthrough film didn’t have an immediate impact on me. Jaws had become part of our cultural lexicon by the time I was able to speak. John Williams’ theme music was omnipresent in films and television, the film’s dialogue was quoted regularly, and the ride was a staple at Universal Studios theme park. As such, I never felt the need to watch Jaws — I figured pop culture had exposed me to all I needed to know. I even saw Jaws 3D before viewing the Spielberg original, the red-and-blue gimmick glasses drawing me in 1983. Finally, in 2011, as part of Now Playing Podcast’s Spring Donation Drive (an exclusive series for donors) I watched the original Jaws and realized I only thought I knew that movie. 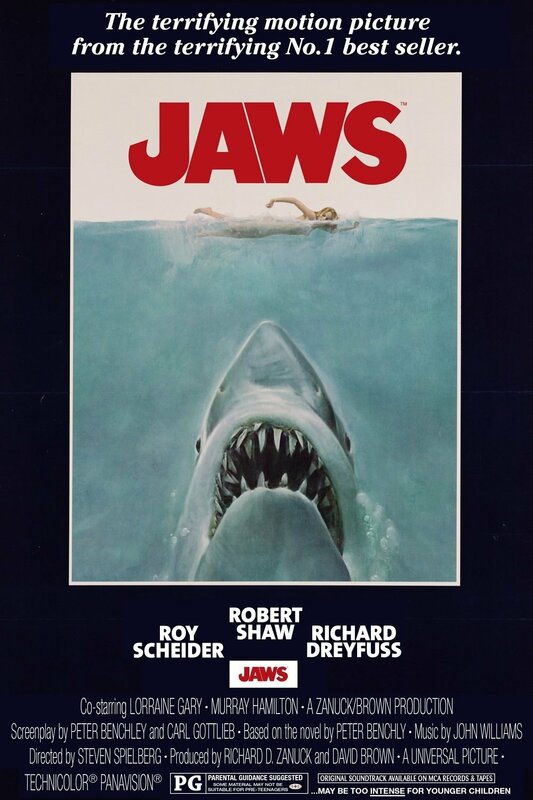 Jaws is not just Spielberg’s breakthrough picture, it’s the original blueprint for the stereotypical “Steven Spielberg Film.” Though it’s based on Peter Benchley’s novel, Spielberg initiated several rewrites to the script to make the film more fun, the characters more likable, and the ending more explosive. T he story follows Amity Island Police Chief Martin Brody (Roy Scheider), a man who must defend his family and his town from a man-eating shark. 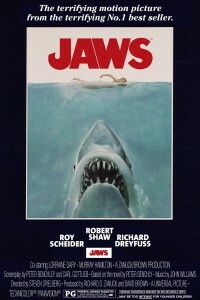 While the story is presumably about the hunt for the shark, the film focuses more on Amity Island town politics and Brody’s relationship to his wife and children. Creating relatable character drama with a backdrop of extraordinary events is the hallmark of Spielbergian filmmaking, and it all started here with a shark tale. The result became his cinematic template — the way Amity Island is made real with its cast of colorful characters is echoed in Spielberg films I had seen throughout my childhood, films like E.T., Poltergeist, Gremlins and Goonies. I was dumbstruck when I realized that with Jaws, Spielberg created a narrative that he would copy, and see imitated by others, for decades. The impact of Jaws, obviously, was felt even more at the box office. It changed moviegoing forever. Until that summer, Hollywood viewed the winter months as the time to release its blockbuster films; summer was a dumping ground for under-performers. But first with Jaws and, a few years later, Star Wars, Hollywood studios began to program the “summer movie.” More, the summer blockbuster had a type: high-concept, audience-pleasing characters, ever-improving special effects. These films captivated moviegoers year-after-year, and throughout the 1980s I was one of the summer masses going to theaters for every big opening day. It was the heirs to Jaws’ legacy that made me love movies. It took me 36 years to get around to watching Jaws, but when I did I immediately recognized that this film’s DNA was passed on to all of the favorite films from my youth. Exclusives. New Product Reveals. M.O.D.O.K. Me! All of this and more were hot topics of conversation at the 2014 San Diego Comic-Con International! Now on this episode of Marvelicious Toys join Marjorie, Arnie, and Justin live on the convention floor as they discuss the exclusives and new Marvel toys and collectibles revealed at this year’s Comic-Con. Plus watch for exclusive interviews with Hasbro, Gentle Giant, Kotobukiya, 3-D Plus Me, and Diamond Select Toys for even more news! Discover the fate of Diamond Select’s X-Men Days of Future Past Mystique figure. Hear Hasbro’s answer as to when Bulldozer will see the light of day. Find out what Koto has planned after their Avengers Art-FX+ series ends, and so much more! It’s just like having a press pass for SDCC, but without the aching back and sore feet! So kick back and enjoy this episode of Marvelicious Toys!